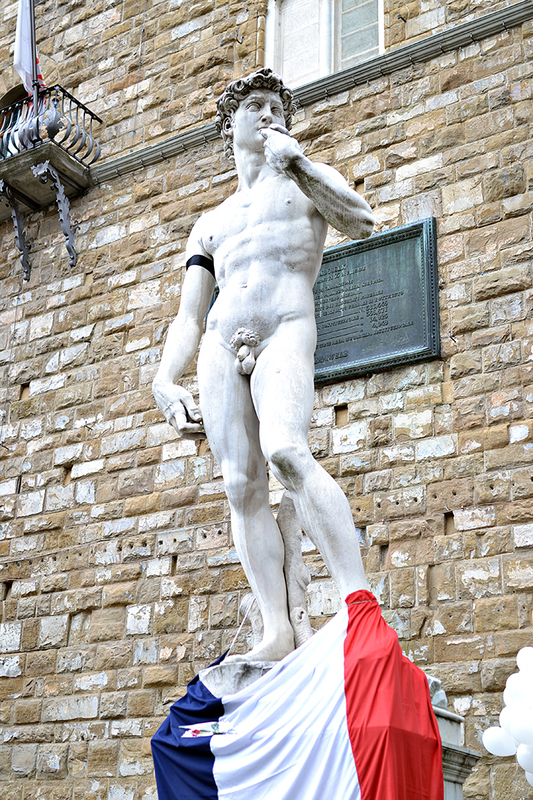 Following last week’s attacks in Paris, the city of Florence draped the copy of Michelangelo’s David, a symbol of strength, with the French flag in solidarity. Last Friday evening I was getting ready for bed when my cell phone began buzzing with texts, calls, and Whats App messages. It was friends and family checking to see if I was ok. They informed me that there had been an attack in Paris. Shocked, I opened up my laptop to see what was going on. Like everyone else, I was stunned and sadden as I read about the brutal terrorist attacks in Paris. Terrorism does exactly what it is meant to do; it terrorizes. You feel helpless, heartbroken for those who lost their lives or were injured and their families, and you think about how easily it could have been you. The following day, as news coverage continued, I couldn’t help but think of my own impending trip to Paris, scheduled for just 6 days after the attack. Of course, I felt fear and thought about all of the horrible what ifs. But mostly, I felt defiant. I don’t want to a live a life in which hatred, fear, and violence win. I refuse to let terrorism win! I think Rick Steves shared some really good points on Facebook last week. He posted a brief article about appropriate responses to terrorism. My Facebook was also full of debates and articles about terrorism around the world, which criticized the “west’s” outrage over Paris but not for places like Beruit. I think these are also fruitful conversations, but for now I wanted to highlight some points that Rick Steves made. Steves said, "I believe we owe it to the victims of this act not to let the terrorist win by being terrorized. That’s exactly the response they are hoping for.” Steves went on to make a point about gun violence in the US, highlighting the fact that almost 100 people a day are killed by gun violence. Am I really safer at home in the US (especially since I am from Florida)? Furthermore, you can’t fight hatred and violence with hate and violence. Let’s not create the next generation of terrorists by turning our backs on those in need, or lock ourselves away from the world and become ignorant to its complexities. Like Rick Steves, I believe that we need to keep traveling, not only to honor those who lost their lives and the amazing city and culture that is Paris, but to stand up against hate and terror. For these reasons I am boarding my flight to Paris today with a sad but full heart. My best friend and I will spend the next six days celebrating the city of Paris (its culture, history, and people) to honor those who are no longer able to.